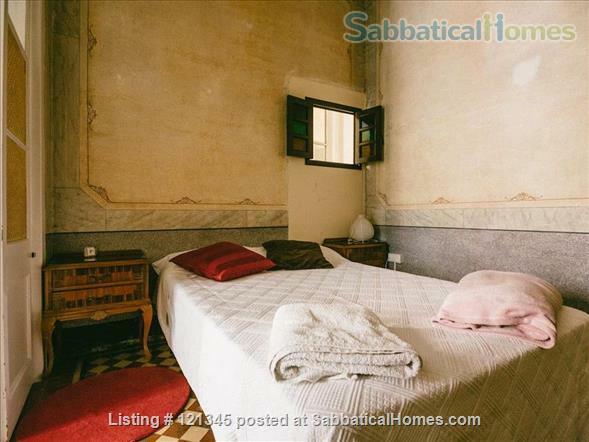 The apartment is in the last floor (3rd) of a patrimonial house built 1886, was built later. It is a cozy apartment very different to the rest of the house. His best caractheristics: you are in the middle of the terraces: in the street side, 100 square metres, in the garden side, near the trees, 30 square metres. You feel in a boat in the city. However, the apartment is small: one room with a double bed, the other room with single bed (twin bed), the kitchen (renovated), the bathroom and a small living room with the sofa. It is cozy and confortable. We can install a work table in the living room or in the single room. The flat is 50 sqm but the terrasses are in total 130 sqm. So the total including terrasses is 180 sqm.We live down stairs so, we will be neighbourds! This apartment is registered (Registre de Turisme de Catalunya) HUTB-006327 and we pay the Tourist taxes to Catalan government. In the first flour there is the artist residency Jiwar Creation and Society, that brings to the house losts of artists from around the world. Our district, Gràcia, is one of the most dynamic districts of Barcelona. The house is situated at just 5 min walk from Fontana’s metro station, which takes you to the city’s centre (10 min) and the harbor (15 min). We have a pet around the house, who lives between our home, the garden and the stairs. He is a very kind 3 legs hairy cat. Our ideal could be rent the flat by month outside the touristic season. I'm the co-founder and coordinator of Jiwar Creation and Society, an artist residency based in Barcelona. From 6 years we are curating projects and giving support to artists from around the world, with a focus in artists from Africa, Maghreb and Middle East region. Our philosophy of neighbourhood pretends to atract more and more also researchers in humanities and social sciences. I'm mother of 2 sons and we are an intercultural family speaking 5 languages (Catalan, Spanish, French, English and Arabic). Staying with Mireia at Jiwar was an incredible experience and is highly recommended. The appartment (you get your own big bathroom, working space, balcony, living area and sleeping area) is too beautiful to be described in just a few words. Coloured glass breaking the sunlight, wide open spaces and a beautiful garden together with an incredibly inspiring atmosphere complete a true once in a lifetime experience.